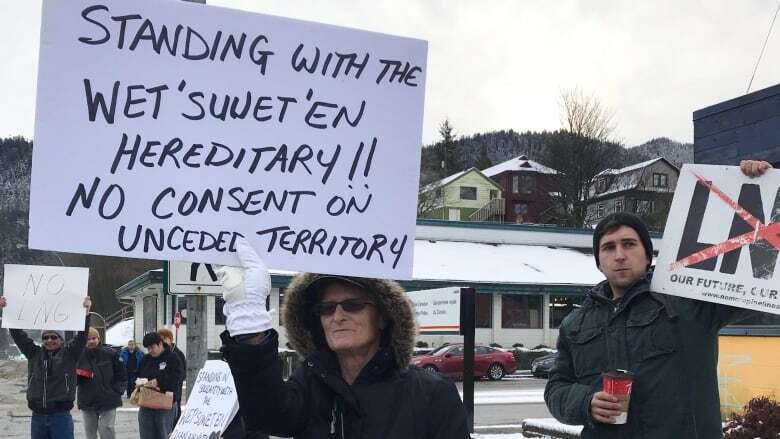 Hundreds of people across British Columbia took part in rallies on Tuesday to support Wet'suwet'en Nation members in Northern B.C. The Wet'suwet'en has been blocking Coast GasLink pipeline workers from accessing a road near Houston, B.C. A day after RCMP officers in Northern B.C. arrested 14 people at a fortified checkpoint blocking access for Coastal GasLink pipeline workers near Houston, B.C., hundreds of people across the province took to the streets. 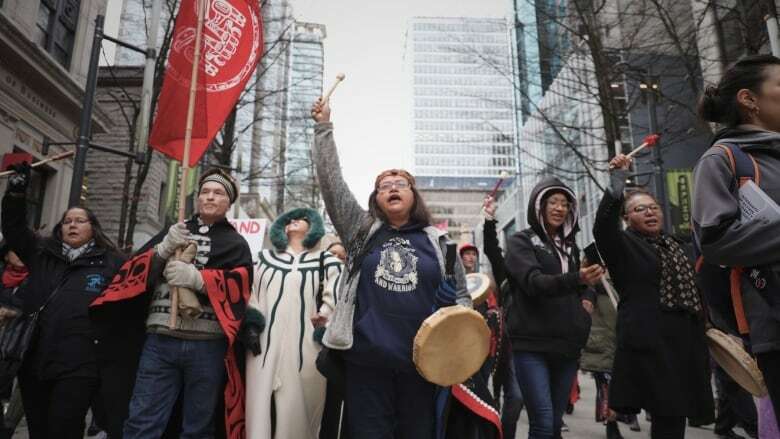 In Vancouver, an Indigenous-led demonstration started at the courthouse downtown and made its way 10 blocks to Victory Square. The march included dozens of people drumming and singing, as well as constant chants and cheers from hundreds more. "I can feel the energy at this rally. 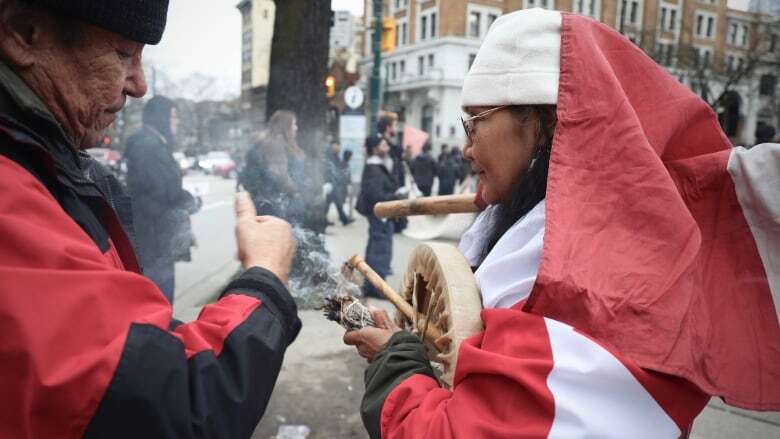 I can feel the deep commitment of the people, and this is only a small per cent of the many, many people that wanted to be here today," said Chief Judy Wilson from the Neskonlith Indian Band. After the police action on Monday at the Wet'suwet'en Gidimt'en camp near Houston, B.C. about 300 kIlometres west of Prince George, RCMP turned their focus to the Unist'ot'en camp, which is also stopping pipeline workers from passing. 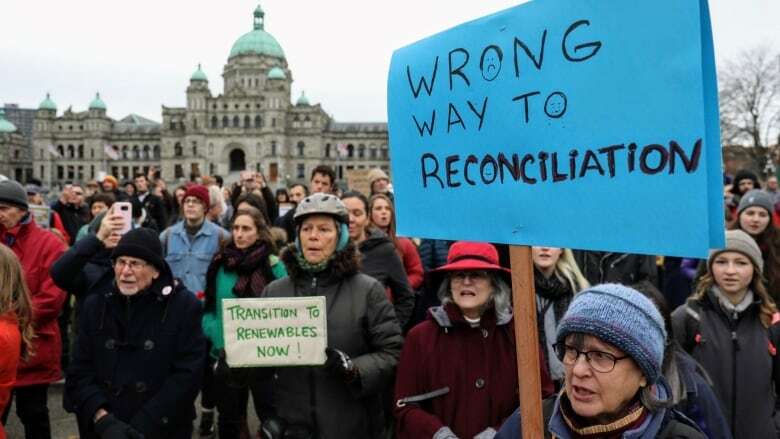 "It's a little heartbreaking having to see what's going on in Wet'suwet'en, because it's something that should not be happening," said demonstrator Verna Smith. "Having to have to talk about reconciliation for so many years and then having to go through this not too long after — it's just too much." 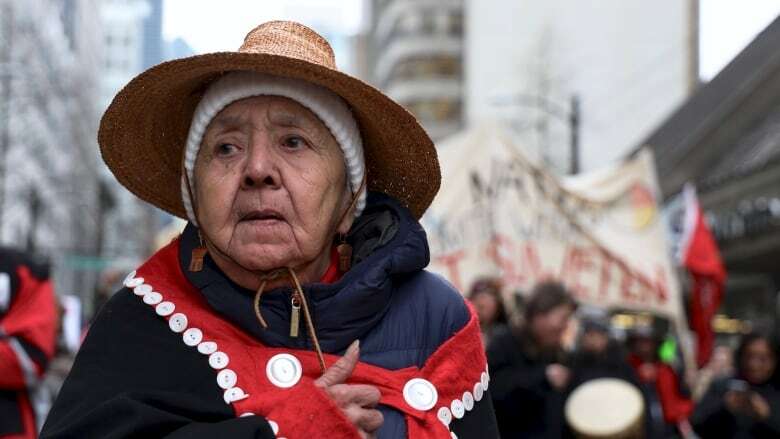 Lois Rullin, a member of the Haida Nation who lives in Vancouver was at the front of the march. "We're trying to protect our oceans, our waters, our rivers, our streams so that we can have fish, all the seafood from our ocean," she said. 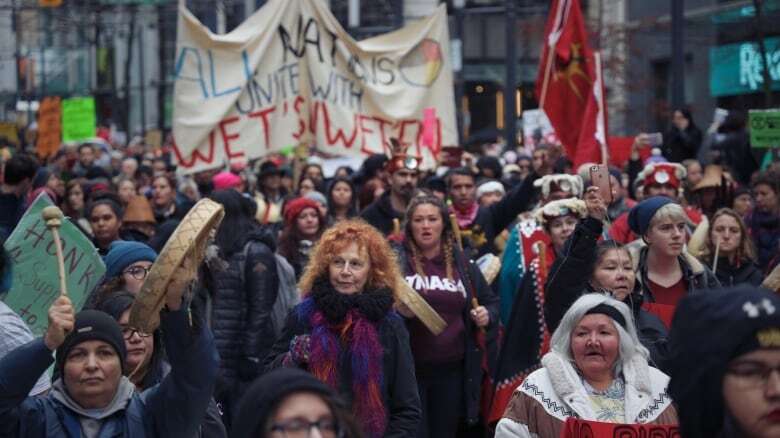 The demonstration was led by Indigenous people, but plenty of non-Indigenous allies and environmentalists joined the crowd. 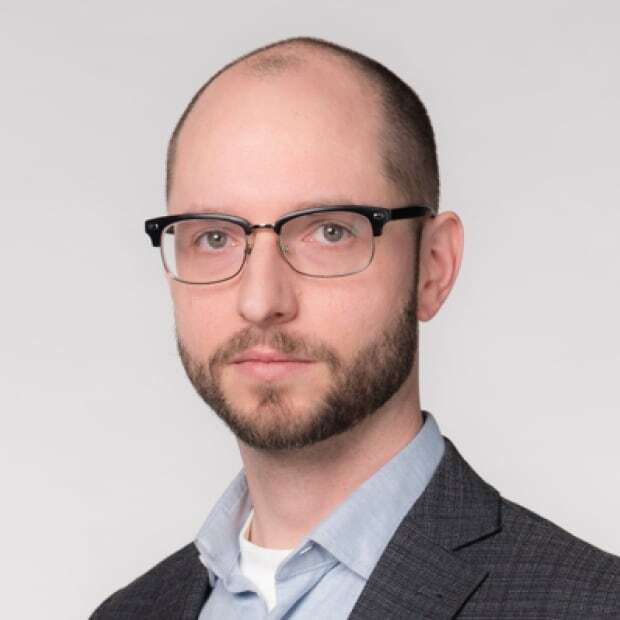 Vancouver Coun. Jean Swanson was there to show her support. "The turnout is amazing. It's a weekday, and there's hundreds and hundreds of people here, so it's great," she said. "I've a lot of respect for the people up on the blockade who are trying to protect their land, and by doing that, they're protecting all of us." 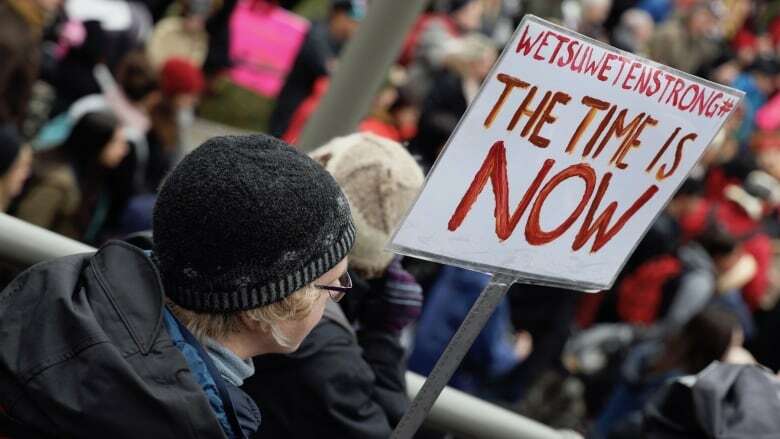 Sandra Vander Schaaf carried a hand painted sign that read "the time is now," along with the hashtag, #wetsuwetenstrong. 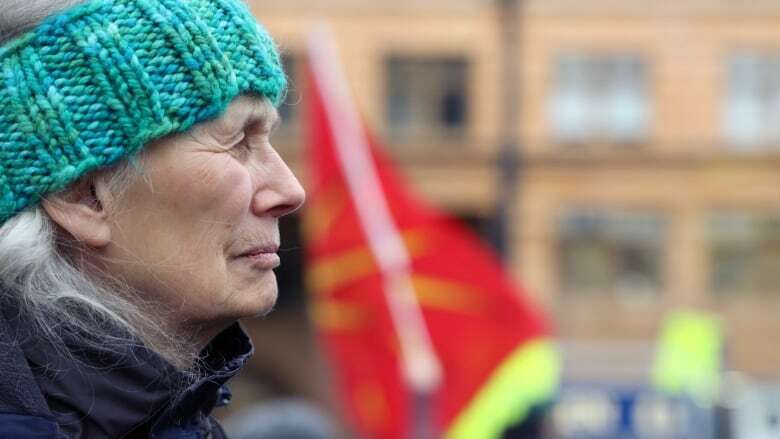 "Coming here today is my act of standing with the people of the land, because I do strongly believe that there are answers in Indigenous ways of knowing that will bring hope and beauty into a pretty devastated climate right now," said Vander Schaaf, adding that she views her protest as "an act of repentance," having benefited from colonialism. When the march reached Victory Square, speakers took turns addressing the crowd. Grand Chief Stewart Phillip, president of the Union of BC Indian Chiefs, drew a roar of cheers when he said, "welcome to battleground British Columbia." 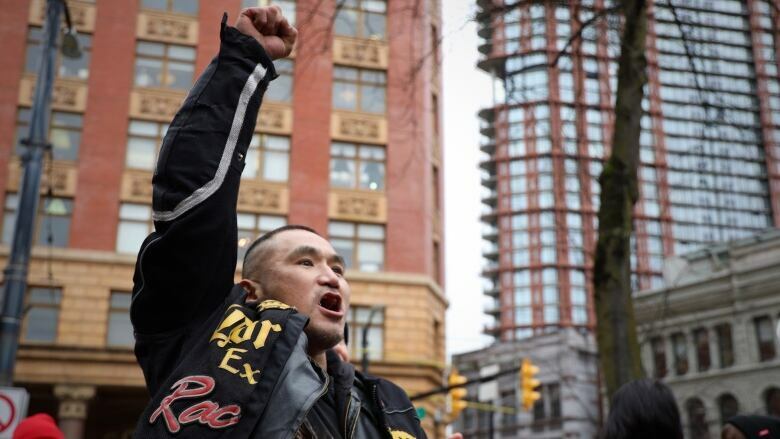 Richard Nazil, a member of the Wet'suwet'en Nation from Moricetown, held his fist in the air. "That's our territory that we're protesting about," he said. "I feel overwhelmed. All these people are here to represent the Wet'suwet'en. I'm so overwhelmed — I love it." Christy David is also from the Wet'suwet'en Nation, though she now lives in Surrey. "They're not going to shut us down. They shut those 14 down, but there's 14 more in place," said David, referring to the people arrested on Monday. "Because it's my cousins and grandfathers and aunties and uncles that are on that front line rights now ... I will not stand by and watch," she said. "We need the whole world to hear this." 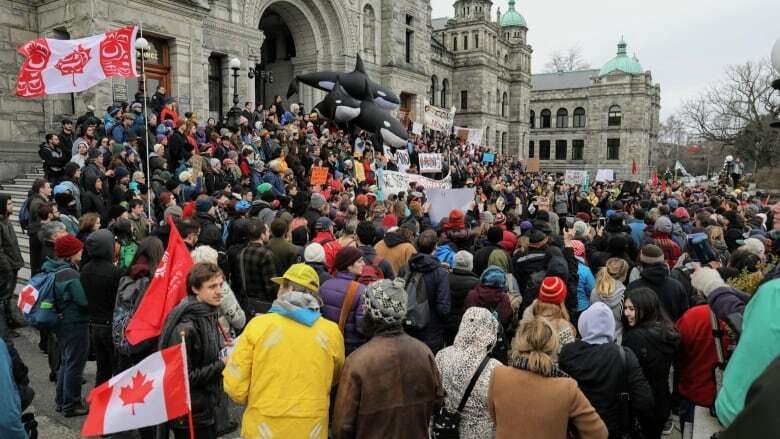 Meanwhile, in Victoria, hundreds of demonstrators rallied outside the legislature. Small rallies also took place in Prince George and Prince Rupert.